Some folks still say that Amazon Web Services is a distraction for the Amazon(s amzn) retail juggernaut, but it’s hard to argue that it’s small potatoes given the growing size of that cloud infrastructure business. For its first fiscal quarter ending March 31, Amazon netted a healthy $750 million in the “other” category of North America sales, up 64 percent from $458 million for the year-ago period. Amazon always cautions that this category also includes “marketing and promotional activities and co-branded credit card agreements.” But I would wager the bulk of that $750 million comes from the aforementioned AWS. No doubt, $750 million is a big number but it’s down from the $769 million compared to Q4; but then again, the category typically sees a dip between Q4 to Q1. Given that Amazon never breaks out AWS any more granularly than this, it’s key to follow this stat quarter to quarter. 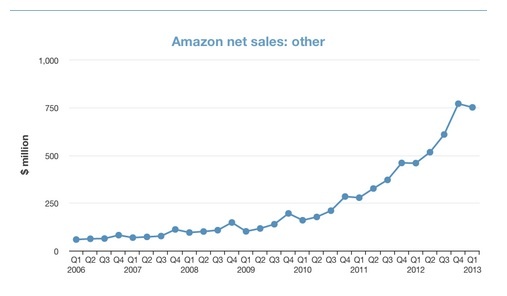 Here’s how Amazon’s net sales looks from AWS inception in 2006 till now. Looking back it was still an interesting play for Amazon. I scratched my head when they first announced AWS, EBS etc… I really didn’t understand the need for a Amazon hosted infrastructure before Cloud was even a term. And wondered who would trust their production systems to a online book store. I guess that’s why I don’t make product decisions.